Item #AZ-2: 4.5"x3.25"x2" tall Blue, Green and Gray Azurite Frogs on Red and Green Matrix. Item #AZ-3: 5"x4"x1.75" tall, Cobalt Blue Azurite Frogs on Red Matrix. 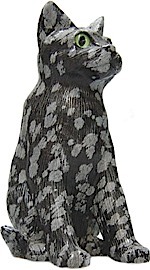 Item #GS-410: 5"x2.5"x1.25" tall Cobalt Blue Azurite Frogs and Snake on Gray Matrix. Item #GS-413: 3"x2.25"x2" tall Blue, Green and Gray Azurite Toad on Red and Gray Matrix. Item #GS-412: 5"x2"x2.25" tall Blue and Green Azurite-Malachite Toads on Red and Green Matrix. Item #GS-416: 4.5"x3"x2.75" tall pinkish Purple Bloodstone Frogs in Green Matrix. 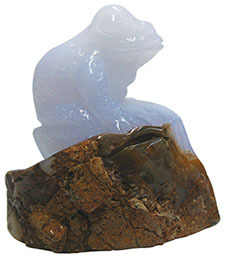 Item #30: 1.5"x3"x1.25" tall light purplish Blue Chalcedony Toad on Brown Matrix. Item #GS-421: 1.75"x2.75"x3" light purplish Blue Chalcedony toad climbing up a rock on brown matrix. Item #GS-438: 2.875"x3"x1.25" tall medium Green Chrysoprase Frog on Brown Matrix. Item #CH-12: 1.25"x2.75"x1.125" tall light Green with slight Brown Matrix Chrysoprase Frogs on Brown Matrix. Item #CH-21: 4.5"x2.5x1.5" tall light Green with slight Brown Matrix Frogs on Brown Matrix. Item #CH-27: 3.625"x2.75"x1.25" tall medium Green Chrysoprase Frogs on Brown Matrix. Item #CH-26: 4.5"x2.25"x1" tall light Green Chrysoprase Frogs on Brown Matrix. Item #CH2: 2.5"x4"x1.25" tall light Green Chrysoprase with slight Brown Matrix Iguana and Frog on Brown Matrix. 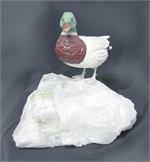 Item #GS-440: 2"x2"x.75" tall light Green Chrysoprase Toad with slight Matrix. Item #GS-441: 2.25"x3.25"x1.5" tall Red Jasper Frog and Green Jasper Leaf. 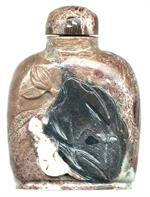 Item #GS-123: 1.75" x 2.5" red, cream, and brown fancy Jasper snuff bottle with black frog design. Item #GS-2146: 2 1/4" tall Fluorite Frog. Item #7: 1.75"x2.75"x1" tall Green with orangy Yellow Burmese Jadeite Frog with three coins on back mounted on 1.25" tall wood stand. Item #GS-266: 1.5"x3.75" tall dark Blue Lapis Lazuli Buddha with Frog. Gray mottling and Pyrite inclusions. Mounted on .75" tall carved wood stand. 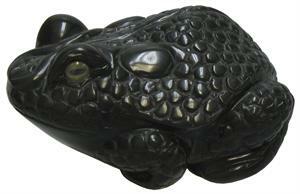 Item #GS-776: 1.5"x2"x1.875" tall gem quality Cobalt Blue Lapis Lazuli Frogs with Blue and Gray Matrix. 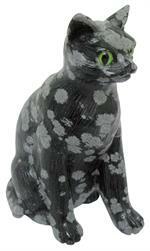 Item #GS-445: Approx. 30 x 70mm Quartz crystal with internal frog. 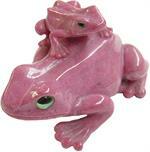 Item GS-450: 2"x2.625"x1.5" tall intense Pink Rhodonite Frogs. Item #GS-451: 5.5"x2"x3.5" tall sculpture of four Pink Rhodonite Frogs on Pink and Black Matrix branches. Item #GS-452: 2.25"x3.25"x1.5" tall translucent Rocky Crystal Toad. Item #GS-453: 3"x2 1/4"x 2" opaque medium pink Rose Quartz frog.